A U.S. Department of Labor contractor has drawn the attention of U.S. Rep. John Lewis (D-GA) – and not in a good way. Lewis recently penned a letter to Labor Secretary Tom Perez to raise his concerns about Office Remedies, Inc. (ORI), a federal contractor that employs workers at the Atlanta branch of the Bureau of Labor Statistics, a DOL agency. IAM District 131 members at ORI overcame a furious anti-union campaign to organize in October 2015. Now the contractor is refusing to meaningfully bargain with its employees, and demanding they negotiate at night and on weekends instead of during work hours, a nearly universal practice. The IAM has filed unfair labor practice charges. “This is particularly concerning given that ORI is a federal contractor which may be engaging in anti-union efforts on official time and in federal facilities,” wrote Lewis. ORI has hired a notorious anti-union law firm, Jackson Lewis, to stonewall its employees at the bargaining table. 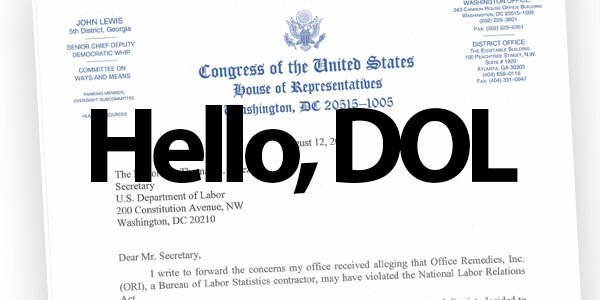 READ: Why is a Bureau of Labor Statistics Contractor Refusing to Bargain in Good Faith? The 81 ORI data collectors conduct surveys that help the Labor Department keep track of employment information. Follow the campaign on the Go IAM ORI Atlanta Facebook page.